Linx Printing Technologies is taking laser coding to new levels with the launch of a range of scribing laser coders, offering the most efficient production line solutions with no compromise on quality.The 10w Linx SL102 laser coder is the most versatile and intuitive coder in its class, ideal for users with a fast line and simple code requirements, or a slow line with a more complex code. The Linx SL102 offers the most flexible solution for quality coding onto a wide range of materials. And the high-speed, low-maintenance 30w Linx SL302 laser coder produces quality coding for complex codes on fast lines, even on hard-to-mark materials, and is versatile enough to adapt to future coding needs, such as changes in line speeds, message types or products to be coded.Choosing a Linx SL laser coder also assures reliability, with longer laser tube life, less downtime and lower cost. The new Linx laser coders are more intuitive – easy to use, with the new LinxVision® colour touch screen, incorporating a large WYSIWYG display for simple operation. The LinxVision operating system features an eye-catching, easy to use 10.1 inch LCD colour touch screen. The interface features software specially designed for touch screen operation, with large icons for intuitive, effortless control, editing and status reporting. The Linx SL102 and SL302 can alternatively be operated via a PC or network. An easy access toolbar enables the operator to quickly modify messages – such as date and time offsets, variable text, message rotation – which means less downtime.A quick message preview also allows the operator to browse saved messages and preview them before selection – which means the right message is selected first time, every time for error-free coding. Meanwhile Linx QuadMark® allows complete control of up to four laser coders on the same network from a single location, ideal for larger sites with multiple lasers and helping to save time and cost, whilst minimising the chances of coding errors.Linx SL models are capable of coding high quality text, graphics and Data Matrix codes onto a wide range of materials and are equally at home coding at high speed, such as in the beverage, brewing and food industries, as they are on slower production lines where more complex coding or marking is required, for example onto glass or rubber. 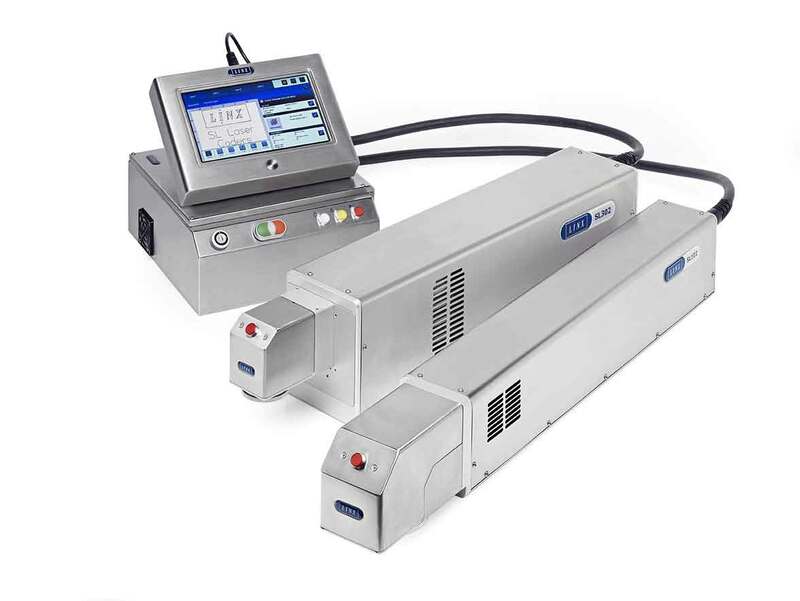 Installation onto the line is made easier, as the laser can be positioned to code in any orientation, so customers are not restricted to placing the laser in one position. A unique set-up wizard guides the installation engineer through configuration for your line setup which means customers can quickly start enjoying the benefits of their Linx laser. The robust industrial design offers stainless steel casing and up to IP65 class protection, for continuous coding in even the harshest of production environments. Linx SL coders are reliable in even the most demanding factory environments, and service intervals are typically twice those of the industry standard. They don’t need expensive factory air for cooling, unlike some other laser coders, which helps to further reduce your coding costs.What’s more, the trusted features associated with Linx scribing laser coders are retained. The Linx SL has the quickest digital galvo response time with the greatest control, giving the laser more time to mark the product. This allows users to code more information, or save laser energy and prolong tube life.